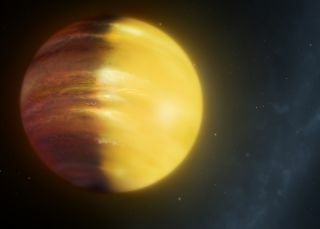 An artist's illustration of the exoplanet HAT-P-7b, a gas giant 16 times the size of Earth with exotic winds of rubies and sapphires that is 1,000 light-years away. Powerful winds sweep sparkling, gem-bright clouds through the upper atmosphere of the huge alien planet HAT-P-7b, a new study suggests. "This is the first detection of weather on a gas giant planet outside the solar system," study lead author David Armstrong, of the University of Warwick in England, said in a statement. The exoplanet's "day side" and "night side" differ greatly in temperature and other characteristics, researchers said. "We expect clouds to form on the cold night side of the planet, but they would evaporate quickly on the hot day side," Armstrong said. Armstrong and his colleagues studied this exotic world using NASA's planet-hunting Kepler space telescope. They pored over observations Kepler made of HAT-P-7b from 2009 to 2013, during the spacecraft's original mission, and noticed that the position of the planet's brightest spot changed greatly over time. Such variation is compelling evidence of weather patterns on HAT-P-7b, Armstrong said. "These results show that strong winds circle the planet, transporting clouds from the night side to the day side," he said. "The winds change speed dramatically, leading to huge cloud formations building up, then dying away." And those clouds are almost certainly unlike anything here on Earth, the researchers added: Modeling work suggests that HAT-P-7b's clouds are composed at least partially of corundum, the mineral that forms sapphires and rubies. The new study shows that it's possible to monitor weather on distant planets — work that can be continued and expanded by future missions such as NASA's James Webb Space Telescope, which is scheduled to launch in late 2018, the researchers said. Armstrong and his colleagues published their results online today (Dec. 12) in the journal Nature Astronomy. The Kepler spacecraft launched in March 2009 and spent the next four years staring at more than 150,000 stars, looking for tiny brightness dips that could indicate the presence of an orbiting planet. In May 2013, the second of Kepler's four orientation-maintaining "reaction wheels" failed, robbing the spacecraft of the precise pointing ability needed to continue this work. Engineers soon figured out a way to stabilize the spacecraft using sunlight pressure. In May 2014, Kepler began a new mission called K2, during which it's hunting for alien worlds on a more limited basis and studying supernovas, asteroids, and a variety of other cosmic objects and phenomena. To date, Kepler has found 2,330 confirmed exoplanets — about two-thirds of all known alien worlds.